The Tawny Mining bee (Andrena fulva) was though to be extinct for 87 years in Ireland. It was rediscovered in two locations in 2012, one of which was close to its original 1925 location in Co. Kilkenny. Since then it has been recorded only from the North Wicklow coast and from some additional locations in Co. Kilkenny. Are there more undiscovered populations out there? 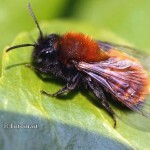 More information on the Tawny Mining bee and what to look out for: Can-you-find-the-Tawny-Mining-Bee? A. fulva was last recorded in Kilkenny in 1925, and was assumed extinct in Ireland until it was recorded twice in 2012. It it likely to be spotted with more frequency in the future as it is common in England and Wales, where it occurs in parks and gardens. Females are very distinctive with bright red hairs on the thorax and abdomen. Medium-large sized solitary species (12-14mm). It is a spring species (March – June). It nests in the ground. The nest entrances will be surrounded by a volcano-like mound of excavated spoil.